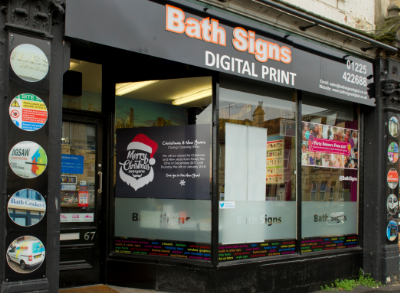 "Bath's oldest established sign company, since 1982"
Bath Signs is an independent Bath based Sign, Design and Print company, that was established in 1982. The company was owned and operated by Roger and Susan Henderson for over 30 years. They have since retired to the South of France and in February 2012 the company was purchased by Charles and Amanda Byrd. As a forward thinking company we have invested in the latest technology and training and we are the areas specialists in off the shelf and bespoke signage of all types. We cover all aspects of signage from design, print, manufacture and installation. Our products/ services include Digital Printing, Wide Format Printing, Retail Signage, Promotional Signage, Printed Workwear & PPE, Vehicle Graphics, Copy & Print Services, Artwork Services and much more. We also design and manufacture Health and Safety Signs in house, and distribute them to businesses throughout the UK. We currently offer over 500 different Health and Safety Signs from stock, these include Fire Exit Signs, Access Signs, Hazard Signs and Safety Clothing (PPE) Signs. We can also create bespoke safety signs (with or without your company logo) which are customised to your specific requirements. At Bath Signs we have a close knit team, who are dedicated to providing a high quality service and are on hand to offer advice and suggestions regarding any of our products. We treat each job with the same level of enthusiasm and commitment, and we strive to provide top quality products, great competitive prices and a fast and friendly service, for all of our customers.